Purpose: Stanford University Product Design Project. Description: To redesign the home air conditioning thermostat controls. The primary focus is on the relationship between the info on the screen and the physical inputs from the user. The design utilizes three button to control all program functionality mapping the up / down selection of options on the screen with the buttons. Additional enhancements, are a filter warning light informing the user when it is time to replace the filter and an economy mode. 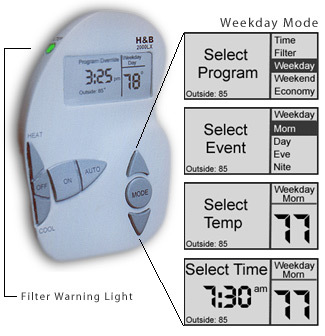 The economy mode allows the user to automatically set the air condition to optimize costs.